More than 78,135,371 beer lovers served! The place is kinda...well, ugly, and maybe not laid out very well, and the brewhouse is packed into a very small corner and cramped by tables in front of the tanks...but never mind all that, because the beers are OUTSTANDING. I didn't have time for lunch on this trip, but next time, I'll be sure to eat, too...Sam Choy's restaurants are famous for serving huge piles of local grinds. Reservations are strongly advised for lunch and dinner. According to Dave, the beers I tasted were all "Batch #1". 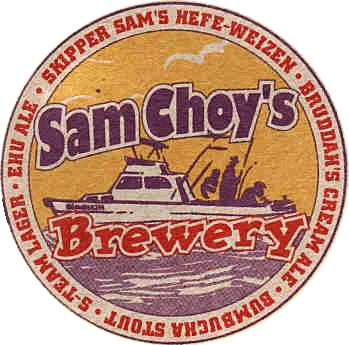 Formerly known as Big Aloha Brewing, it may or may not still be associated with Sam Choy's. Golden, low carbonation, big dense head. Malty, slightly citric aroma. Light body, moderate carbonation. Lots of wheat flavor. Good hop flavor at the end. Black, OK tan head. Strong sweet coffee aroma. Thich, bitter, roasty, sweet, but not sticky. Lots of burnt malt-coffee-chocolate flavors that last forever. Maybe just a little too long. Brown, moderate carbonation, low head. Smells brown, a little roasty, with a hint of spicy hops. Just sweet enough, good brown malty flavor and finish. Very well-balanced beer. Light brown, good carbonation and head. Grapefruit aroma. Big citrusy hop flavor. Good body...real close to being a you-know-who clone. Dark yellow opaque, low head. Burnt banana aroma. Big clove-banana flavor. Good body, high carbonation. Lots of sweet banana at the end. ADULTERATED WITH LEMON.